Q. Compare and contrast mail, telephone and personal contact as account management strategies. ANSWER: The basic aim of the account management program is to communicate properly with the customers and try to fulfill their requirements. It can be done through mail, telephone and personal contact. Although they perform same type of job there is a number of similarities and dissimilarities among these media. The basic goal of BT’s Account management program is to provide excellent relationship among customers and fulfill their communication needs. Mail, telephone and personal contacts, through these three media, they are trying to fulfill customer requirement. In this way the aim of these three communication media is almost same. Each communication media provided by BT is based on trust. So in case of mail, telephone and personal contact BT is always careful to provide good service and thus create trust among the customers through building good relationship. The account management program is such a process that requires teamwork. So the three communication media -mail, telephone and personal contact combined used to provide services in certain situation, like when face to face contact is needed or need to send a written statement but the ultimate responsibility for managing an account remains with that TAM. In the account management program all these are used to increase the repeat purchase through mail, telephone and personal contact BT tries to influence customers to be their life time customers and thus purchase BT’s product and services in a regular basis. As seen in the case, the value of an account to BT was much more than just line rental charges and fees for network usage. The company also sold a wide range of telecommunications equipment, installation and maintenance and an array of value added services. Communicating through mail, telephone and personal contact it is always taken into account that the employers contact with the customers in a polite tone or in a polite language and provide adequate information required by the customers. So communicating through all these media requires training and the training program is also similar for this three media. The use of mail service can make delay in getting information. Sometimes it takes longer time to reach the destination. On the other hand, Telephone and personal contact can be used to convey messages quickly. So if we think of timeliness, mail service is not ideal. Sometimes personal service is more convenient than others. For instances, if customer needs any kind of repair in their system, then it cannot be solved through mail or telephone. On the other hand, if we do cost benefit analysis it shows that it increases the overall service cost as technicians need to go physically to that place and solve the problem over there. Therefore TAM made a policy that if some company used les than six lines then they would treat that as a small company and would maintain communication through telephone. For small companies with a single line TAM was not very effective. For those the use of TAM was not a cost effective proposition. So the effective ness is different in different media. The technicality of the three media is totally different. As we see in BT’s case, broader penetration required connecting customers to its network via BT’s local lines, which often still used conventional technology. However, in case of personal contact there remains no question about this type of problem. Evaluate the way in which BT designed and implemented the TAM program. ANSWER: BT is a UK wide communications solutions provider with a global reach in the business market. Post Office Telephones became British Telecom under the conservative government of Margaret Thatcher in 1981 when the postal and telecommunications businesses were split apart. The term TAM or telephone account management came to be used at BT as an acronym for both telephone account manger and telephone account manager. Telephone account managers were carefully selected salespeople trained to handle a wide portfolio of products and services, working up to 1,000 assigned accounts entirely by telephone. The TAMs would be trained to develop specific objectives for each call where they were expected to update their knowledge of the customer’s situation and needs, check whether any problems needed solving and plan a specific date for the next call. The primary objective of this was to ensure continual account buying from BT rather than competition and tries to develop accounts by selling additional products and services. The basic goal here was to continually build and refresh knowledge of the account base, and be the first to address or even anticipate communications needs. Along with this each TAM would endeavor to develop a relationship based on trust. The TAM concept was designed in such ways so that customers would remain the focal point throughout the contact cycle. Whether an order was taken or not, the TAM would establish when the next call was to take place and put it on the calendar. All information collected would be fed into each customer’s electronic profile. TAM pilot was inaugurated in 1986.This was done after re-creating the database by acquisition and integration of lists of customers from numerous different sources. The initial objective was to derive sales principally through referrals out to the sales force and had started by qualifying the prospective customers and calling all the manes on the list with impressive responses. As a program the TAM concept had tried building loyalty among consumers and defending against any future competition with a qualified sales force. Sales force here, that is, the total staffing, exceeded 450 persons. The annual cost of TAM was around $41,000,of which 50% was salary meaning the staffs were remunerated well along their job lines. Now, to build a customer, firm relationship, maintaining an employee base is crucial. When a firm retains its customers, it indirectly retains its employees also. 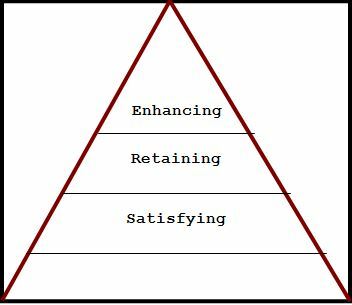 An underlying logic of customer retention benefits to the organization is shown in Fig. A.Here, it shows that employee loyalty leads to quality services provided, which is evident in the case by the example of Green&Meakin Limited. Customer satisfaction is the next step after quality service, which in turn leads to customer retention and increased profits. The TAM program has evidently proved that it provides quality services but has been unable to satisfy consumers thereby hampering retention. The TAM concept and its implementation policies vary according to the company size. Take the case of Green&Meakin ltd. When the TAM program was first initiated, the firm had three lines, and was assigned to Helen Dewhurst, having exclusive responsibility for its account. But as the company grew, telephone service usage grew and a sixth line was installed. This additional line automatically set in motion the upgrading process, unknown to the firm itself. A file was then compiled whereby the company was handled to a new team and when informed of this, the firm expressed grievance and unsatisfaction regarding the system. Green&Meakin ltd did not view their handing over to a new group as a useful move and hence wrote a letter to the TAM sales manger expressing dissatisfaction. This incident reflects that the TAM policies have not been clearly provided while the customer first initiated the service. This is also an indication that while formulating TAM policies the concept of satisfied customers has not been deeply thought of. The goal of relationship marketing has always been to maintain a base of committed customers who are profitable for the organization. BT has been unable to fulfill this requirement as is evident from the case. A simple demonstration of relationship marketing is shown in FIG.B. FIGURE.B: Customer goals of relationship marketing. BT’s evaluation regarding their TAM program has proven that although they are successful in getting their customers, they have failed to satisfy them by their policy of operation, which might affect their customer retention in the future and the enhancement of those customer base. The goals of relationship marketing, is hence, unfulfilled when it comes to retaining the customers and satisfying them for further relationship enhancement.